Sometimes it’s quite surprising how many films you have watched involving the same actor. French actor and director Mathieu Amalric has appeared in a great many movies, including English language as well as his native tongue. Probably the best known is The Diving Bell and the Butterfly (2007) when Amalric gave the performance of his life portraying Jean-Dominique Bauby who following a massive stroke left him in a condition known as Locked-in Syndrome. He secured two Best Actor awards for this role. Steven Spielberg’s Munich (2005) gave him an interesting role as Louis, an informant who is in cahoots with the Israeli government’s secret plot to assassinate those whom they suspect of carrying out the massacre of their athletes during the 1972 Munich Olympics. Nowhere as exciting was the ‘man at the masked ball’ part in Sofia Coppola’s Marie Antoinette (2006) mind you it did have a fantastic soundtrack! Next on my DVD shelf is The Singer (2006) a romantic musical drama he shared with the back to form Gerard Depardieu and the lovely Cecile De France. He won two more Best Actor awards for 2007’s Heartbeat Detector, a film I’ve never been sure about. The same year as The Diving Bell and the Butterfly he had a supporting role in Claude Millers adaptation of Philippe Grimberts best selling novel A Secret again sharing screen credits with Cecile De France. 2007 was a great year for Amalric not only did he appear as the villain in Quantum of Solace and opposite Vincent Cassel in Mesrine Part 2 but appeared as Henri in one of the best films to come out of France in the last few years A Christmas Tale in which all the family are summoned to their parent’s residence for the Christmas holidays to learn that their mother (Catherine Deneuve) has leukaemia, all the hidden complexities of family life rise to the surface with its tensions and conflicts. Alan Resnais latest film Wild Grass (2009) featured Amalric as a local police officer. Which brings us to his first film where his acting duties and directorial responsibilities have collided. 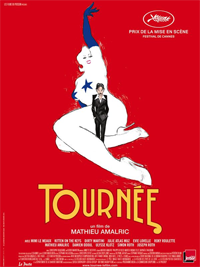 On Tour (2009) was inspired by a book by French novelist Colette, who is best known for her novel Gigi, the director wanted to translate the sentiment of book to a modern setting and it is best described as a type of road movie. The story involves former TV producer Joachim Zand (Amalric) who has just returned to France, after a long spell in the USA, with a Neo-Burlesque troupe. We follow the group as they tour various French port cities with their show, Zand promises the girls that the final performance will be in the French capital city itself. Amalric’s role is of a very troubled individual, who seems almost protected by the girls and someone that has no idea how to look after his two sons when his estranged wife leaves them with him. Genuine Neo-Burlesque performers Mimi Le Meaux, Kitten on the Keys, Dirty Martini, Julie Atlas Muz, Evie Lovelle and Roky Roulette and not professional actors, play the company’s artistes with the shows staged in front of a live audience in real clubs. It was not intended for the director to act in the film and this decision was only made three weeks before shooting was due to start. My main criticism is that the film is disjointed and that the award winning French actor is to young to play the role, therefore not entirely credible. Admittedly not your traditional musical but the best parts are with out doubt when the “girls” are on the screen, with their spontaneous dialogue and banter the films worth seeing for them alone. The film premiered at the 2010 Cannes Film Festival where it won FIPRESCI Award, the festivals main prize from film critics. Amalric also received the Best Director Award.